Diving in Lanzarote Diving in Lanzarote an exceptional experience! a more than exceptional experience! Diving in Lanzarote is possible from the north up to the south of the island because there are several unique places which make diving an extraordinary experience. Wich types of diving are available? Different possibilities shore dive, boat dive, shipwrecks up to drift and wall dive to tuna wrecks, beautiful underwater nature to the most marvellous caves and not at least the unique sculptures of the Museo Atlántico, the only underwater museum in Europe! 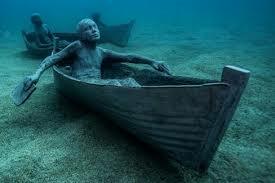 Created by the artist Jason deCaires Taylor world renowned for his underwater creations. These unique places make diving in Lanzarote more than worth it! The Museo Atlántico is designed to generate an artificial reef on a large scale finally complete and consists of different groups of sculptures. √ the Rubicon, a group of 35 human figures walking towards a wall. √ the famous Raft of Lampedusa, a reference to the current refugee crisis. √ a group of children in little brass boats called Los Jolateros. The collection of statues situated in a sheltered area at a depth of 12 to 15 metres. This experience will hopefully lead to a better understanding of the need to value and protect our marine environment. 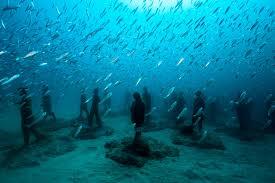 Daily divers are taken by boat to the underwater museum. Also, snorkelers get a chance to visit the Museo Atlántico on a special snorkelling trip. From the surface, however, you will only see the shapes of the statues, no details. Furthermore, for people who do not have a diving license, a special program is provided to visit the Museo Atlántico. √ a boat dive to Museo Atlántico. The first dive is a dive from the shore together with an instructor. After the pool session, you will dive the Museo together with a private guide at a ratio of 2:1. If you’re interested in surfing in Lanzarote here’s some interesting news!